Federal Reserve meets this week and is widely expected to deliver another rate increase. 5) Mixed domestic consumer spending figures. There is nothing here that has us very concerned, and after months of upside surprises to growth, things were bound to settle down a bit. 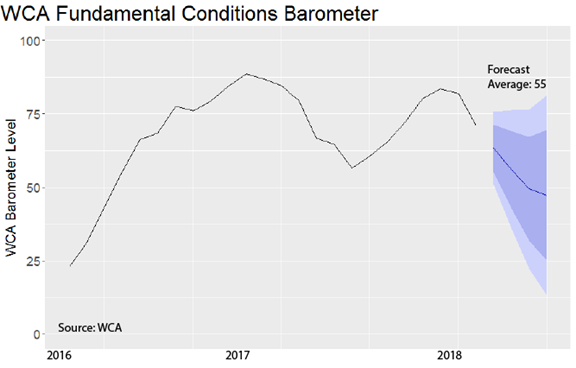 As our WCA Fundamental Conditions Barometer shows below, we expect to see some further easing in the near-term outlook for fundamental conditions and growth. We are also monitoring changes in credit spreads and earnings forecasts. Investors priced in a lower recession and default risk and higher expectations for corporate profits in the last year. In the weeks following the tax cut, the spread on Baa corporate bonds tightened significantly versus long-term Treasury bonds. By late January, the spread was near a cycle low at 140 basis points (1.4%) over Treasuries. In the last month, the Baa spread widened to a 52-week high near 170 basis points (1.7%) as the stock market advanced and recouped most of its February decline. The signals given off by the stock and bond markets are more muddled now than several months ago. As for earnings, S&P 500 forecasted profit rose from $130 at the start of 2017 to $140 before the December tax cut. By the mid-February, the forecast surged to nearly $160. Since then, however, forecasts have flattened out and talk of tax cuts has been replaced by talk of tariffs and trade war. While economists and policy enthusiasts seem concerned by talk of tariffs and reprisals, consumers are less worried. The University of Michigan Consumer Sentiment Survey for March recorded the highest reading since the 1997-2000 period. For all the worry over trade hitting the headlines recently, consumers say that they are as confident as ever. We continue to believe that the economy remains on a growth track, despite some recent mixed signals. Equity exposure remains above neutral in tactical asset allocation portfolios, but we cut back equity exposure last week given the slippage in our WCA Fundamental Conditions Barometer (above).